Tales from the Den of Chaos: Time's up! I’ve got fifty pairs of cotton socks still curing that will need their triple-wash tomorrow, but other than that…it’s done. Over. Finished. What isn’t already tucked into the big old plastic totes and ready to go, ain’t going with me to Witchapalooza this weekend. It was a fun challenge and it got me going, but I don’t want to operate like that again pretty much ever. It’s hard to keep your colors fresh and different when you’re doing twenty or fifty of them in a single session! Also, ohmygah, but is my house ever a wreck. Mind you I’m hardly held up at a paragon of housecleaning virtue in the first place, but I’m thinking a fire hose might be in order for what has resulted from me being busy with dye pots and ironing boards all week. I knew I was perilously close to burnout when I found myself thinking that I could hardly wait for next week, when I could spend some time doing housework. Help, I think I’ve been abducted by aliens! My thoughts, they are not my own anymore! Who IS this stranger inside my head?! In addition to the yarn that I haven’t relisted on Etsy yet (I’m holding off on listing all of this stuff until after the show – I don’t want to list things then have to un-list them because I sold them at the show) (or worse, sell the same thing TWICE – no two of these are exactly alike), I’ve got stuff like this. This one was fun to make. 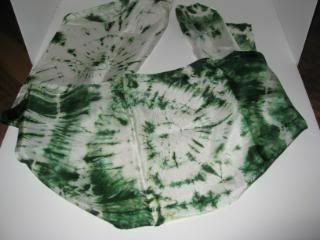 A little fiddly (each circle was, of course, hand-tied before dyeing), but it turned out neat. Which makes all the fiddly worth doing. 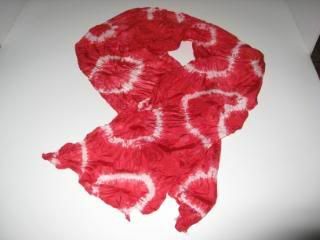 This is a short scarf, the kind that hugs your shoulders. This is probably my favorite of all the things I did this week. My favoritism is partly driven by the fact that it did exactly what I wanted it to do: Big center swirl, smaller swirls at the ends, ‘starburst’ pattern between the three. Not everything was so obliging. Usually, you see this kind of thing in a fancy department store (or a wanna-be-fancy one) in the men’s department – they’re the kind you fold up and tuck into that top pocket on a man’s suit. They’re just plain beautiful (if I do say so myself, and I do). 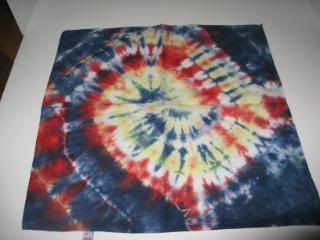 They’re done with acid-wash dyes (the ‘acid’ is vinegar, by the way…I don’t do super-heavy-duty chemicals around here) – a process that requires “cooking” and all that groovy jazz. 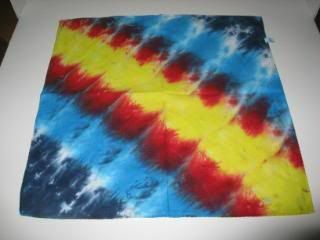 The colors are rich, and the way the silk takes the dye is just…well. It has a sheen and drape and grace that is hard to describe even with pictures. When you hold one of these in your hand, it just feels good. Light like cobwebs, but strong at the same time. And the colors, when seen by a human eyeball in person rather than in a picture taken by a pretty inexpensive digital camera, have shimmering layers of depth in them. And you know what else? If you’ve got a long-running cold and your nose is sore? That silk feels like a dream. Of course, it’s easy for me to be all “you should totally use silk if you’ve got a cold, it feels good.” I have a front-loading washer that can handle the cleanup afterward for me (along with my bras and those frilly little dresses the girls are so fond of which I totally don’t get because even as a child I pretty much wore jeans, jeans and nothing but the jeans so help me God) and clotheslines not only in the backyard, but one I can string across my upstairs bathroom as well in less than thirty seconds when I need it. I imagine if I had to hand-wash them in my bathroom sink and drip dry them over the towel rack (while my towels went…uh…hmmm…on the floor, I guess? 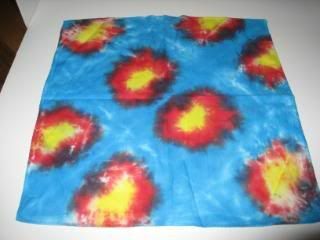 ), I might be a little less enthusiastic about them as a daily-use hankie. Whiiiiich brings me to the workhorses of the group: The cotton handkerchiefs. 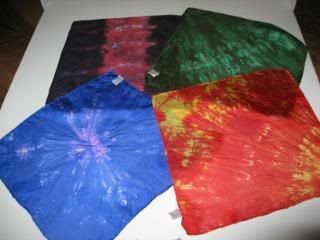 These are nice BIG kerchiefs, which has the added bonus of giving me lots of room to play. This one makes me think of a rocket trail through space. There are 186 more of these, so, uh, let’s just stop with the pictures now, ‘kay? Not because I didn’t think the socks were cool or that they weren’t worth the five bucks – it was that my Denizens are about the worst little humans on the planet when it comes to Sock Abuse. They stuff them under seats, wear them outside without shoes in the rain, leave one at Grandma’s and the other at the park…it’s horrible, what those kids do to sock. So I buy them plain white ones in 50-pair packages at Big Box R Us and growl at them whenever they complain about how boring they are. But then I thought, you know, just for giggles…I could try dyeing some of them. And lo, it was fun and kewl and funky and the kids loved them and after all, who doesn’t need yet another addiction in their life? Ahem. Anyway. 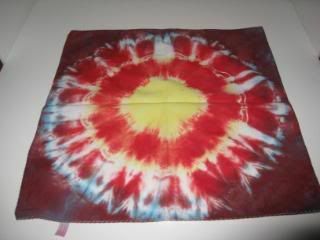 I’m afraid the best examples are still in the dryer (all the actual tie-dye ones, for example), but here are a couple I kind of like. I like these because they’re sweet. 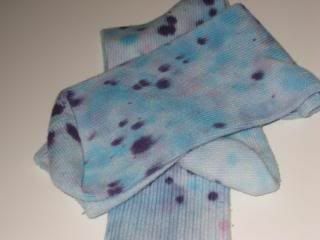 These are done by doing the spots first, then basically dipping the sock in plain water and SQUEEZING the colors together into a watercolor ‘wash’. And I like these because they are fugly. I made crisp black and yellow stripes, then thought, “YA KNOW, if I did that squeezy-thing on this, I’d get, what, kind of greenish-yellow stripes? Ewwwww, that would be so…ZOMBIE…HAHAHAHAHA, OK, now I HAVE to do it…!! !” and sure enough – ZOMBIE SOCKS!!!!! 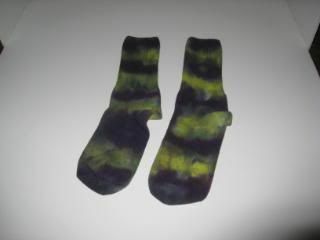 Don’t they look like they were dipped in radioactive waste?!?! It feels really weird to be in this saddle again. Back in the day, I did a lot of fairs and festivals in all kinds of capacities; sometimes I was a performer, sometimes I was a vendor, sometimes I was just involved in setting up or breaking down the stages. I’m sure things will go wrong, and I won’t be happy with my booth (because I have never been 100% happy with any booth setup, my own or anybody else’s for that matter), and I’ll spend a lot of time in the artist purgatory, wondering if my stuff is “good enough” and picking it apart and thinking of all the ways I could have made this one better or that one less ugly or why did I even bother doing that one, again?! But I have to say…it feels pretty natural, too. I can’t wait to find out what I’m going to forget to bring with me. Good luck for the weekend! You GO! Hope you get cleaned out and make oodles of new contacts as well as the $$$. Also: congrats on the new Dye Assistant. I wish you had been my mum!! PS: verifcation: dencets. Maybe that's what we stalkers should call ourselves?? Excellent! Have fun and I hope the crowd who NEEDS your things shows up at your booth. I'm just plain bummed that I can't make it over there to check out your stuff, meet you and say Hi! I'm usually up for a road trip but I have to work at the office on Sunday and I need my only weekend day to do exciting things like housework, grocery shopping, blahblahblah. Next time maybe! Husband's suit jacket to fold a spiffy silk hankie into to demo? Otherwise I'm sure you've got it all! Drive safe and sell lots! I hope you've been having fun and selling all your wares! I'll bet you had a fabulous time, not-quite-perfect booth and all. I'm glad you made Eldest's day home from school fun even if she was a bit under the weather. Btw, your vinegar is about 5% acetic acid, which is a chemical not to be messed with--especially if it happens to be heated a bit. Even at 5% it can chew up your skin pretty good if it's a little warm. And I do know from experience! On the plus side, vinegar is a great way to kill off any fungal infections on your skin. If you use it a lot though I would say get some good acid proof gloves.